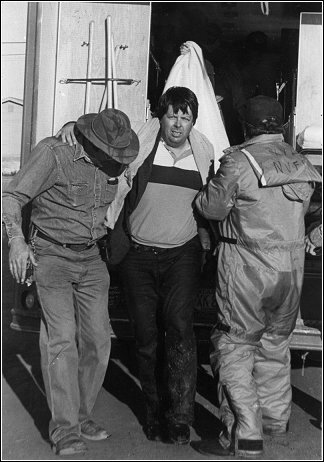 On August 13, 1993, Don Wharton was one of seven survivors of a small plane crash into the Bering Sea near Nome, Alaska. 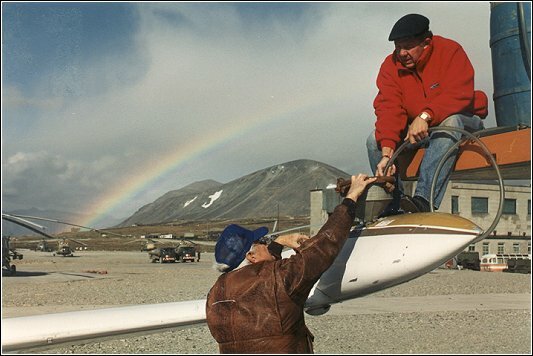 The group was returning from a missionary/humanitarian aid trip to the Russian Far East when their plane experienced fuel problems and was forced to land on the ocean near Sledge Island, some 27 miles from Nome, Alaska. The plane sank into the ocean a minute after the group exited the plane. Until help arrived, they were forced to float in the 3- to 6-foot waves of 36-degree water with only the aid of empty five-gallon gas cans. <Don in the rescue helicopter. Air traffic controllers contacted another airplane flying in the vicinity of the Navajo's crash site and asked them to assist in a possible rescue. The Bering Airlines pilot had earlier spotted what he thought was a whale in the water and surmised that it might have been the missionaries' plane hitting the water. He circled back to the approximate spot of the siting and saw the survivors in the water. Survival time in water that cold is only 10-15 minutes, so a helicopter was quickly dispatched to the scene. The firefighter on board the helicopter brought seven body bags with him because he had never before pulled out a live person from that water. One by one, all seven people were heroically and miraculously rescued and ferried to Nome by two helicopters. There the injured and cold survivors were rushed to the Nome Hospital for treatment of hypothermia. Five of the missionaries were released from the hospital that night and the other two were released the next day. F.A.A. officials have stated that this group was the first to survive a plane crash into the Bering Sea and also the longest to survive in water temperature that cold without a thermal suit. Don has been sharing the rescue story at his appearances for the past several years. 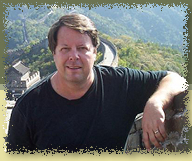 He has challenged audiences including Dr. James Dobson's "Focus on the Family" radio show; corporate groups such as Boeing in Seattle and the Billy Graham Association in Minneapolis; the inmates at the Grant County jail in Marion, Indiana; a very special concert in the central court area of the Pentagon in Washington, D.C.; as well as a variety of churches and schools across the country with the message of God's rescuing power. 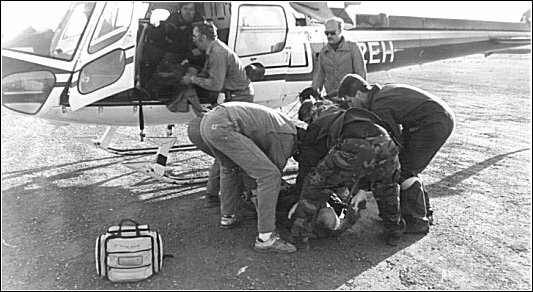 <Don is helped from the ambulance following the rescue at sea. “Dealing with life's challenges is a matter of trusting God in all situations. Make no mistake about it," says Don, "if we would have died in the crash, we would have still been rescued. Jesus Christ provided that rescue 2,000 years ago on Calvary. However, God didn't take us to heaven on August 13, 1993. He provided our rescue, perhaps so we could share the message that if God can rescue us, then He can rescue anyone. It won't be easy. You might not even be rescued in the way you want to be rescued or on your time schedule. But His word is true when it says, 'Trust in the Lord with all your heart, and lean not on your own understanding. But in all your ways, acknowledge him, and He will direct your path.'" American missionaries with our Russian friends.